I cannot tell you about the moments in Faces Places that brought me the most happiness. This is partially because those moments are clustered in the film's last 30 minutes, and they are far too wonderful in their little surprises for me to dare spoil them. This is partially, also, because they are so pure and wonderful as images - they are meaningful and moving above all else because of the sight of them, and the expression on the faces of the people involved. Over-describing them could, I think, only damage the delicacy of the effect they create. Now then, onto the question of what Faces Places (a fair English iteration of the much more beautiful French title Visages villages) is. 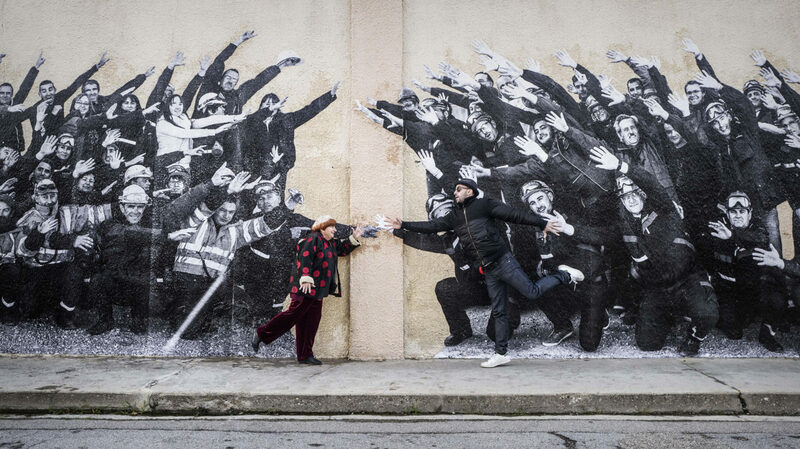 The film is a collaboration between director Agnès Varda and photographer/street artist JR, and given how much more important the first of those people has been to the history of the motion picture, it's more than a little tempting to say it's basically her movie. And my God, it's such a Varda movie. But JR's presence is not to be dismissed or diminished: he's definitely adding a certain something to all of this. The film feels more or less of a piece with Varda's two most highly-celebrated works of the last 30 years, 2000's The Gleaners and I and 2008's The Beaches of Agnès - all are autobiographies dealing in some capacity with her increasingly present awareness of time and her own age - but the emphases are all different. Faces Places, for all its focus (increasingly so as it goes on) on Varda's aging, failing body, is a young film: it is drunk on the joy of creating things without worrying about what you're creating, at running out into the world and engaging with it in whatever way seems to make sense at the time. More concretely, the film is the document of a project the two directors came up with sometime after their first meeting in 2015: using JR's photo-taking van (a portable lab with enlarging equipment inside to make enormous blow-ups on sheets several feet wide; the outside of the vehicle painted to look like a giant SLR camera), the two would travel from one small town in rural France to another, photographing the locals and plastering their images on the sides of buildings significant to the subject, or anything else that seems large and flat enough to do the job. And that's kind of it? There's much more to the movie, but it all seems to slide invisibly into the project, it's not really the "plot" of the thing. Let us say that it is of a piece with all of Varda's best documentary work, stretching all the way back to her short travelogue films in the late 1950s that quite casually and without missing a step twist themselves into politically alert social commentaries. Like those, and like many of her work since, Faces Places turns out to be something very different, while also being the thing it seemed like at first, and it is very good in all registers. As far as the main project of the film goes, it's a warm human-interest experiment, dedicated to the idea that every person's story is interesting, and every human face is of intrinsic visual interest. The latter of which should come as no surprise, given the title: Faces Places is dominated by faces, not least of them Varda and JR's own. But anyway, I was speaking of the project: a tribute to everyday humans, by turning them into monumental artworks - a man confidently looming over the farm he has tended for many years, his strong stance posted to the side of a barn; a woman truck driver asserting herself over a male-dominated field by standing tens of feet tale on a pyramid of shipping containers. And there are smaller-scale moments, like two children delightedly taking a self with the grand mural of their mother. This is all impossibly sweet, and if this was everything there was to Faces Places, the film would certainly run the risk of being just too damn nice and cloying for its own good. And, if I am to be wholly, mercilessly honest, the film's biggest problem is the way it starts to sag in its middle third (it is a tidy 89 minutes in total), when it starts to repeat itself: aye, every human life is worth of artistic commemoration and all that, but Varda and JR are commemorating a lot of them in very similar ways. The thing is this is somehow not the actual focus of Faces Places, despite taking up a sizable majority of the film's running time. There's a meta-story here, more explicit in the earliest and latest scenes, that's as much about the two directors having a blast working together and feeding off of each other's creative energies. The opening of the film is a playful montage that's one of the most New Wavey things that I think I've seen in any film made since the New Wave ended: little "what if" vignettes of how the filmmakers' paths might have intersected, with Varda buying the last two chocolate éclairs before JR can get to them, or bumping into each other at a crowded nightclub (the image of Varda happily grinding away to techno is the most overt of several moments throughout the film where she unabashedly leans into her persona as cinema's most adorable grandmother; I would, indeed, say that Faces Places is the film where she finally goes full Herzog in playing herself as the character beloved by her fans rather than simply being herself; this is perhaps uncharitable, and certainly argued against by the film's later scenes). As the film progresses, it very carefully and deliberately places in moments where Varda is in some way aware of her physical age - often something to do with her blurry, fading eyesight - and JR is there to keep her spirits up. As the film approaches its end - and I really must not go into details, but I really want to - this grows more and more pronounced: particularly in a scene where the two pay homage to one of the great moments in French cinema, and JR brings all the youthful vitality and madcap physical exhilaration for himself and his collaborator, dancing and jumping along while helping Varda experience a sense of freedom her old body can't have on its own. It is, for all that I've just mangled it in the description, the most purely happy, uplifting scene I've watched in 2017, and one of two moments where the film made me cry from sheer pleasure (the other is Varda-led singalong in a car). And later, when the film made me cry from annoyance and rage and frustration, JR is there to redeem a dark, even cruel moment by helping Varda to see it as artistically generative. Some of this, I think, is pure artifice; some of this, I have it on reasonably good authority, is not artifice, no matter how much it seems like it is. All of it, regardless, is a wonderful tribute to the invigorating presence of a young, bold artist in the life of an elderly, bold artist, who has the sharpness and insight of her youth firmly intact, and spend the film accessing that flicker of youth in ways she perhaps assumed were not going to happen again. It's a film about aging and nearing death, unquestionably; it is also a film about refusing to be "old" just because of those things, and finding all of the small and large bits and pieces of joy and delight that can always be gleaned from life, in all circumstances. It's a great exercise in challenging how we see things, in a very literal way (at times, so literal that it becomes obnoxiously cute), functioning as the optimistic, humanitarian answer to the late films of Jean-Luc Godard (whose symbolic presence haunts the movie, right from the early moment Varda notes that JR's omnipresent sunglasses remind her of her own colleague), and demonstrating that a new way of seeing can be turned towards finding and understanding the good things in the world, wherever you might find them.